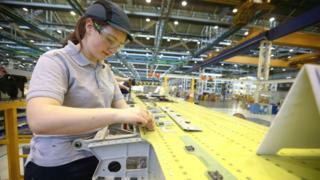 A levy on UK employers to pay for apprenticeships will bring no new money to Wales, the skills minister has said. The UK government has said Wales will get around £130m a year from its share of the levy, being introduced in April. All employers with a wage bill of more than £3m a year will pay 0.5% on it. Julie James told AMs that the proceeds would be offset by cuts in funding elsewhere, and the loss of £30m that Welsh public sector employers will have to pay the UK Treasury on the levy. Former Chancellor George Osborne announced the plan to raise £3bn to fund apprenticeships in England in his 2015 Autumn Statement. All employers with an annual wage bill of more than £3m will pay a levy of 0.5% of the total. As skills policy is devolved, the money would not necessarily be spent on apprenticeships in Wales. Instead, the Welsh Government is entitled to a population-based share of the proceeds under the UK Treasury's Barnett formula, to be spent as ministers see fit. The UK government confirmed on Monday that Scotland will get £221m, Wales £128m and Northern Ireland £76m in the first year of the levy, rising after two years to £239m, £138m and £82m respectively. Questioned by AMs on Tuesday about the prospect of extra money, Ms James said: "The figures that have been released by the UK Treasury do not mean significant new money is coming to Wales. "They do not take into account reductions made to comparable English programmes, including apprenticeships, and need to be considered as part of the bigger picture, which shows - you'll not be surprised to learn - real terms cuts to the funding available to Wales over the next few years. "Nor do they show the effect of some £30m which will be paid back to the Treasury by Welsh public service providers through the levy." Ms James added: "The levy is nothing more than a UK government employment tax which directly conflicts with areas of devolved competence. "We have our own distinct and very popular approach to apprenticeships ... and this just cuts directly across it. "Not only do we not have any new money, but clearly all our public services have to pay the levy and so they're deprived of funds. "It makes no sense at all and we're very cross about it." A UK Treasury spokesman said it was up to the devolved administrations to decide how the cash would be allocated. "The levy will provide the Welsh Government with £128m in the first year alone, and puts this funding on a sustainable footing so more and better quality apprenticeships can be created," he said. The Welsh Government has pledged to create at least 100,000 high quality all-age apprenticeships over the next five years. The Welsh Conservatives' skills spokesman, Mohammad Asghar, said it was "vital" the proceeds of the levy were reinvested in training and "not frittered away on Labour's pet projects". "Welsh Conservatives have long called for this money to be ring-fenced to support businesses but Labour's resistance could act as an incentive to take jobs out of the country and discourage potential investors from bringing new jobs to Wales," he said. A Welsh Government spokeswoman said ministers were planning to spend more on apprenticeships - £111m a year - than they expected to receive from the UK levy. Plaid Cymru AM Simon Thomas told the Senedd he was concerned for employers such as North Wales Police, which he said did not offer apprenticeships but would still have to pay the levy.